To the untrained eye, many of the hundreds of artifacts pulled in recent months from a Florida spring in the Chassahowitzka River look like stuff nobody wanted to buy at a yard sale: old bottles, an antler, broken pieces of a plate, a toy cap gun, a bowl, a fishhook, pins. But to archaeologist Michael Arbuthnot, who oversaw a five-month project that pulled hundreds of such items from a 2 1/2-acre field of muck as deep as 25 feet below the surface of the spring, they are much more. "We found an amazing array of artifacts that basically represent every period of human occupation in Florida," he told CNN in a telephone interview. The finds were a side benefit of a project funded by the state to clean the spring -- located 90 minutes north of Tampa -- and thereby improve its flow and water quality. The spring in the Chassahowitzka, which is Seminole for "place of the hanging pumpkins," attracts tourists, canoeists and fans of fishing. But over the years, it has also attracted gunk -- from septic tank effluent to runoff from the surrounding watershed -- that contributed to algal growth that made it less attractive. "This thick organic deposit was basically choking out the spring," said Philip Rhinesmith, senior environmental scientist with the Southwest Florida Water Management District. "All around the vent are these accumulated organics," said Arbuthnot, who oversaw the salvage effort for SEARCH, a cultural resources management company. "As the divers were basically scooping it into their 6-inch dredge, they were keeping their eyes peeled for artifacts that might show up." He described as "phenomenal" the preservation of the finds, whose location as many as 5 feet deep in oxygen-free sediment had protected them from decay. 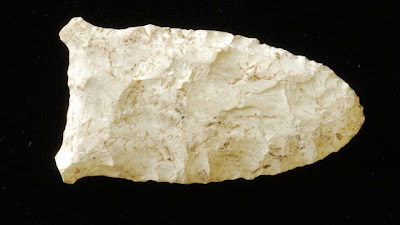 They include a Suwannee projectile point -- a spear point -- whose estimated age of 10,000 years puts it "right at the cusp of the end of the Ice Age," Arbuthnot said. The person who lost it may have been hunting a mammoth. 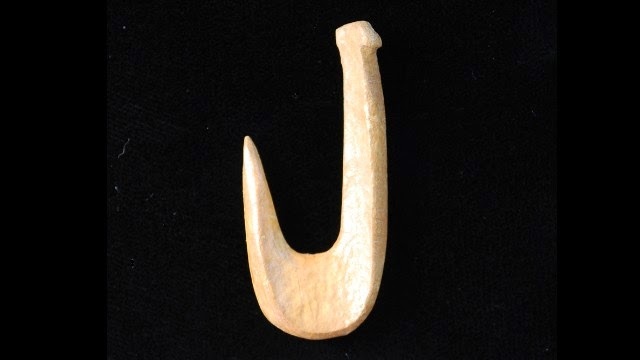 A fish hook made of bone dates back centuries B.C. and also could have been used to catch alligators, he said. 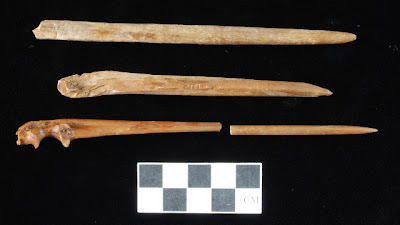 A variety of bone pins -- used for piercings, fish hooks, awls and fastening clothing -- was also unearthed. In the dredging operation, which began last May and ended in September, the underwater archeologists vacuumed up the sediment on the floor of the basin, put their finds into a floating screen platform and then picked through the clutter, Arbuthnot said. It wasn't always clear what was worth a second look. For example, the bowl didn't look like anything special when it was spotted. "Divers first thought it was a coconut, because it was upside down," he said. But the coconut turned out to be the bottom of a bowl, stained black by years of exposure to tannins in the water. It proved to be a 2,000-year-old, intact ceramic bowl with an earthen brown interior -- in good condition. "That's a big surprise," he said. "They're extraordinarily rare." The discovery of fragments of a 17th century plate -- a Spanish ceramic -- also surprised the investigators, given that Citrus County is far from the nearest Spanish colonial settlement. "I'm guessing that it was probably either intentionally dumped there or accidentally dropped in some sort of a trade route with the Native Americans." A more remote possibility is that a Spanish explorer may have visited the area and traded it to Native Americans there, he said. The plate, which would have been nearly 14 inches in diameter when it was intact, "has an exquisite, painted decoration on the surface of it." Years under water had stained blue its original vibrant colors, he said. 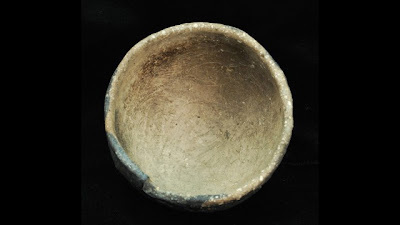 Arbuthnot said a shard of brushed pottery dated to the 1700s and showed that the Seminole Indians were connected to the spring. The antler was probably used by Native Americans to help fashion stone tools, he said. The cap gun -- a Hubley Long Barrel Texan Jr. from the mid-1900s -- was made when gun manufacturers were transitioning from cast-iron to die-cast cap guns and, like all Hubley toys, it was hand-painted. That there would be finds under the surface was not a surprise. "We know from past experiences that there's generally a treasure trove of artifacts to be found" in the muck around springs, said Arbuthnot, whose underwater work includes an expedition to the Titanic in 2005. "It was pretty obvious from the start that this was going to be a hot spot." But it was also full of plain, old-fashioned, modern trash -- Budweiser bottles, old car parts. Anything younger than 50 years does not meet Florida's definition of an artifact and was not saved. The salvage part of the cleanup cost Florida taxpayers $180,000. "What that paid for was having a certified marine archeologist on the job when that dredging was happening," Rhinesmith said. That meant the cleanup project didn't have to stop every time an artifact was found, which sped its completion. 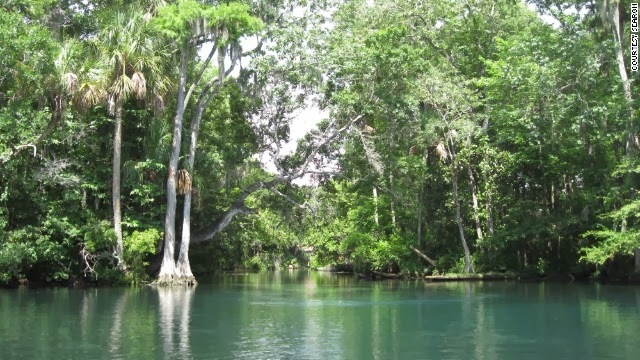 Time was an important factor, he said, because the work had to be completed between May 1 and September 30, when the region's water temperatures begin to drop and West Indian manatees -- a federally protected species -- seek out the warmer waters of the spring, he said. Because the finds were made on state-owned land, they belong to Florida. Some of the finds are to be displayed at the Old Courthouse Heritage Museum in Inverness. For now, they're neatly labeled on racks in a laboratory in Gainesville -- a cornucopia of history.